This article provides a workaround for the issue where Dreamweaver CC 2017 does not display correctly on Windows Hi-DPI machines. If you are using Dreamweaver CC 2017 on a Windows Hi-DPI machine, and have increased the text size beyond 100%, then some panels in Dreamweaver do not display correctly. For example, the Preferences (Edit > Preferences) panel does not load any content. Other panels can also appear truncated. 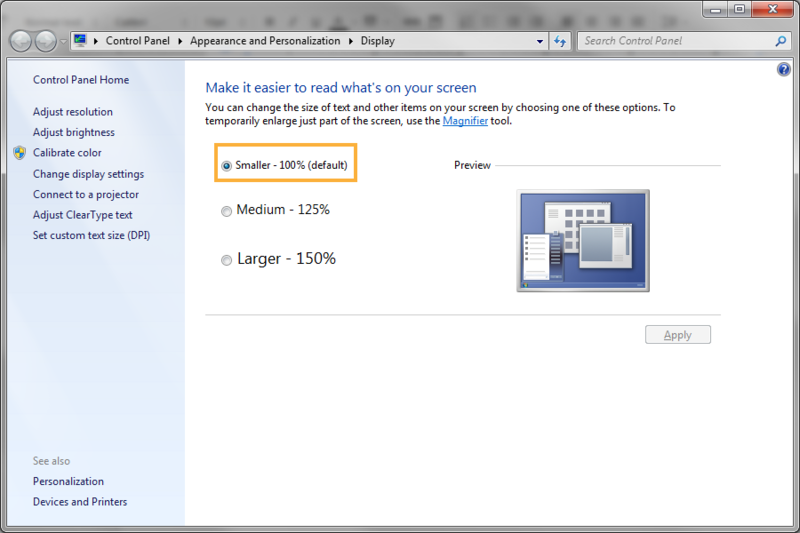 In the Windows Display settings, set the font size to 100%. Close Dreamweaver CC 2017 and launch it again. Navigate to Control Panel > Appearance and Personalization > Display. In the Display window that appears, choose the Smaller (100%) default option. Close Dreamweaver CC 2017, log out of Windows and log back in again. All Dreamweaver CC 2017 panels appear correctly. Search for and locate the Dreamweaver.exe file. Right-click the file, and select Properties. By default, Dreamweaver installs in C:\Program Files\Adobe\Adobe Dreamweaver CC 2017 location. In the Compatibility tab, deselect Disable display scaling on high DPI settings.